One of the best experiences in Cabo is getting out on the water. Whether it be a sunset cruise, a sailing charter or even a fishing charter; there’s nothing like the cool breeze of the ocean on a hot Cabo summer day. I took this photo from another because I loved the view of the boat right next to the arch. 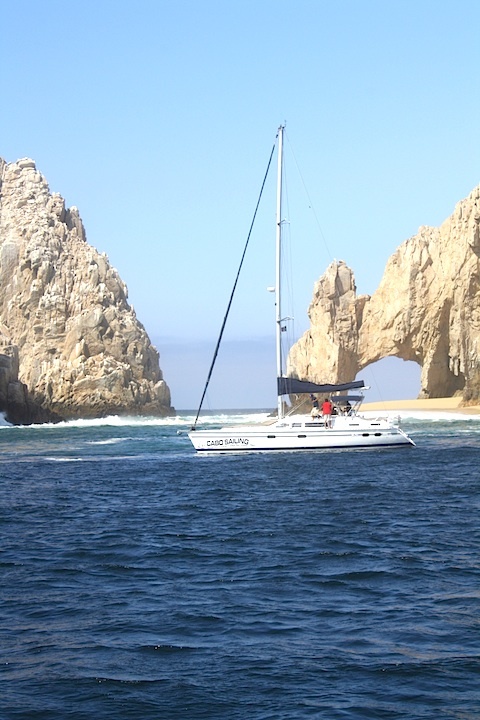 The arch and lover’s beach are staples of almost all boat rides in Cabo. And the great thing is that it never gets old! If you want to go sailing in Cabo, you can even charter your own sailboat and see the sights with your own private crew. Or you can join a sailing tour and meet new friends. Been itching to learn how to sail? You can do that too. Have you been sailing in Cabo? Did you go on a snorkeling cruise, whale watching cruise or a sunset cruise? What was your favorite part of sailing in Cabo?